Submitted photo Louden Love and the Wright State University Raiders are off to the NCAA tournament. 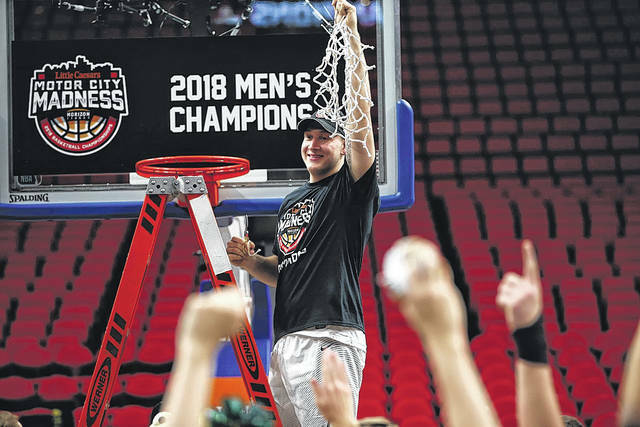 FAIRBORN — The Wright State University Men’s Basketball Team will host an NCAA March Madness Selection Show party at 5 p.m. Sunday, March 11 in the atrium of the Student Union. The Wright State community, alumni and public are invited to join the Raider players and coaching staff as tournament brackets are unveiled for the annual, three-week event to crown the national champion. The pep band, and cheer and dance teams will also be on hand to celebrate, and the University Bookstore will be open for fans to purchase championship merchandise. Parking is available in front of the Student Union. The Raiders will learn their first-round tournament opponent when the NCAA announces selections on TBS beginning at 6 p.m. First-round games will be played March 15-16 at sites located around the country. The NCAA tournament bracket, including site selection and dates, will be released 6 p.m. Sunday, March 11. Wright State will receive a limited number of tickets from the NCAA for its first-round game that will be allocated to coaches, student-athlete guests, university staff members and Wright State Raider fans. Raider fans can submit their request for up to four tickets. Single-session tickets – two games for the first and second rounds are $110 per session. Orders will be fulfilled based on Raider Athletic Fund donor level and season ticket holder status. The deadline for the online ticket request form will be 10 a.m. Monday, March 12. Fill out the online form to qualify for tickets. WSU will be making phone calls to anyone who qualifies for tickets starting Monday afternoon to collect credit card payment information. Please note that a request is not a guarantee that the order will be fulfilled. For those who don’t qualify for any allotted tickets, join Raider Nation by purchasing tickets through our host site’s box office. Raider fans wishing to attend the NCAA Tournament run are encouraged to visit www.WSURaiders.com for ticket information. For more information, follow the Raiders on Twitter (@WSURaiders) or like Wright State University Athletics on Facebook. Contact the Wright State Athletics Ticket Office at 937-775-4934.
https://www.fairborndailyherald.com/wp-content/uploads/sites/50/2018/03/web1_WSUWin.jpgSubmitted photo Louden Love and the Wright State University Raiders are off to the NCAA tournament.